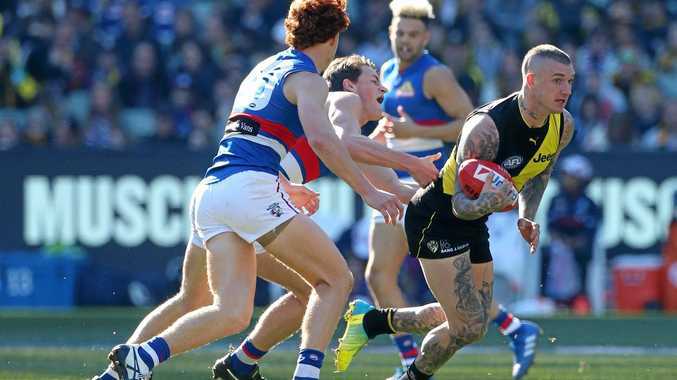 JACK Riewoldt booted five goals on Saturday to firm his grip on a third Coleman Medal and lead Richmond to a tense three-point AFL win over the Western Bulldogs at the MCG. It was far from the Tigers' most convincing performance but that would matter little for the minor premiers, whose dominance at the home of football has them primed to claim back-to-back flags. The win extends their record unbeaten run at the MCG to 21 games and takes their final regular-season tally to 18 wins and just four losses. Bulldogs star Jack Macrae had a stunning first half, racking up 25 disposals, nine marks, six tackles and a goal as the Dogs went to half-time with a three-point lead. The Tigers appeared to get through unscathed, leaving them well placed for September with Kane Lambert and Dan Butler set to return for their first final.